Like any zombie apocalypse horde, the Zombicide series by Guillotine Games just won’t die. Through four enormously successful Kickstarter campaigns, the Zombicide games have raised nearly $10 million since 2012 and have made the games among the most popular board game projects launched from the platform. As a fan from the start with the first Zombicide, I backed Zombicide: Black Plague last year along with nearly 21,000 other devoted fans. After skipping the third round in the series, the reinvented game with a medieval fantasy theme and updated rules brought me back to the fold. Buying in at the Knight’s Pledge level, I wound up with an enormous pile of gaming goodies, including the base game, the werewolf-themed Wulfsburg expansion box, 40 extra survivor characters, dozens of additional zombies and all sorts of extra playing aids. With the base game blessedly shipping ahead of the 2015 holiday season, I was able to get this re-launch of the zombie franchise on the table over the past week. I cut my teeth on gaming with Dungeons & Dragons in the 1970s, so the theme of Black Plague and the basic dungeon-crawler play of the Zombicide series intersect nicely in this new game. Survivor player characters include a dwarf, warrior, wizard and archer which are right at home in the fantasy world of the game. As with the previous Zombicide games, the survivors work collaboratively to search the game’s map of heavy cardboard tiles for items such as weapons, shields, armor, spell scrolls, food and other special gear. After following turn actions of moving, searching, opening doors, rearranging gear and gathering objectives, zombie cards are pulled and the horde builds. As zombies are destroyed in combat actions, player experience builds which leads to more and more zombies swarming the board. From there, its a race for survival as each scenario’s objectives and win conditions are achieved. One of the most welcomed innovations in the new game is the survivor dashboard. In a game with so many cards and experience, wound and skill tracks to manage for each player’s survivor character, having a tidy and intuitive plastic base is a huge boon to game play. A slot in the center holds the interchangeable character card, weapons and other items are held in left and right ‘hand’ positions, five slots represent space for extra items in the character’s backpack and a sliding experience track traces along the bottom of the dashboard. An extra slot overlapping the character card allows for an extra quick-draw weapon like a dagger or a protective shield or armor. While regular zombie types of Walkers, Runners, Fatties and Abominations have carried over from the previous games, Black Plague introduces a new Necromancer zombie type with its own set of mechanics. When the Necromancer enters the board, an additional zombie card is drawn with zombies to accompany him. Additionally, a new spawn point is generated where the Necromancer appears and activates once the Necromancer escapes the board via the nearest exit. Destroying a Necromancer allows the players to eliminate a zombie spawn point. While a bit complicated at first, the Necromancer mechanic adds a new twist to the game in creating an additional moving target for the survivors to deal with while also completing their main objectives, avoiding being killed by other zombies and (hopefully) winning the game. Aside from the Necromancer, most rules have remained largely unchanged with some minor tweaks. Fatties are no longer accompanied by Walkers, making them slightly easier to kill but the Abomination is still a pretty tough foe with only a combination of a vial of dragon bile and torch able to eliminate them in a fiery combination. The jury is still out for me on the double-spawn zombie cards which can carry from one spawn point to the next in doubling and then re-doubling zombies coming on the board. This makes for a bit of a confusing mechanic which I wasn’t quite certain added much to the game. 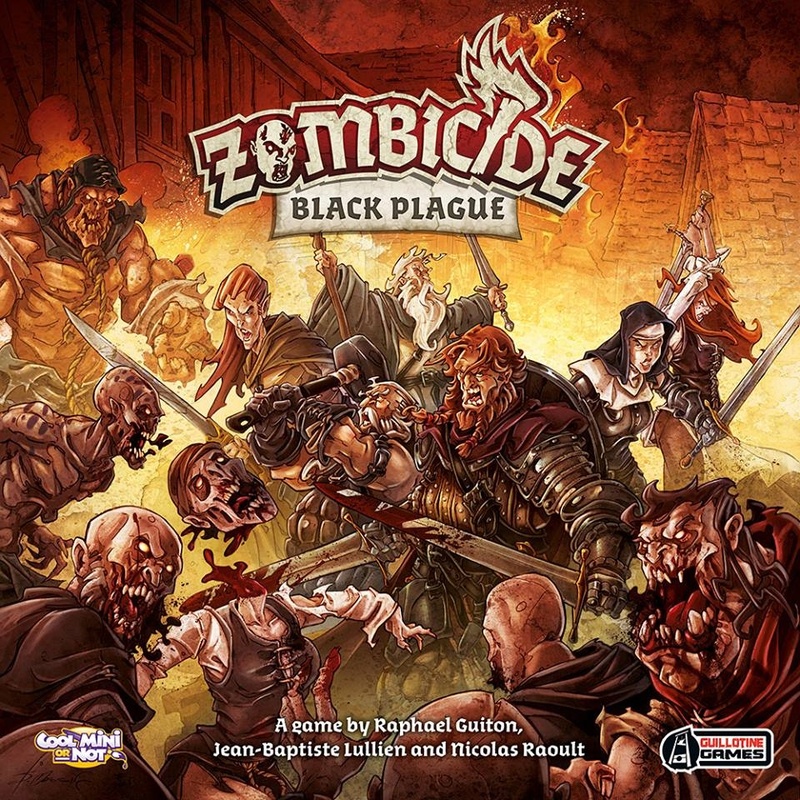 As with all the previous Zombicide games, the art and sculpting in Black Plague makes for a stunningly fun game to look at and play.The ten base scenarios included in the rules offer a progressive mini campaign of sorts, and additional scenarios are sure to come. With all the expansions and add-ons ready to ship this year, there’s going to be a ton of replay value with this game. I had been feeling a bit played-out with the original Zombicide games based in more familiar contemporary environments of city streets, a prison and a mall. Black Plague’s reboot preserves the easily playable mechanics and engaging design in a refreshing medieval wrapper. Where the franchise goes from here either in additional fantasy expansions or in yet another thematic direction like a futuristic sci-fi realm remains to be seen. In the meantime, sword-slashing and spell-casting through the Black Plague zombie apocalypse will be a ton of fun. Tagged: board games, Cool Mini Or Not, Dungeons & Dragons, Guillotine Games, Kickstarter, Zombicide, Zombicide: Black Plague, Zombies!! !